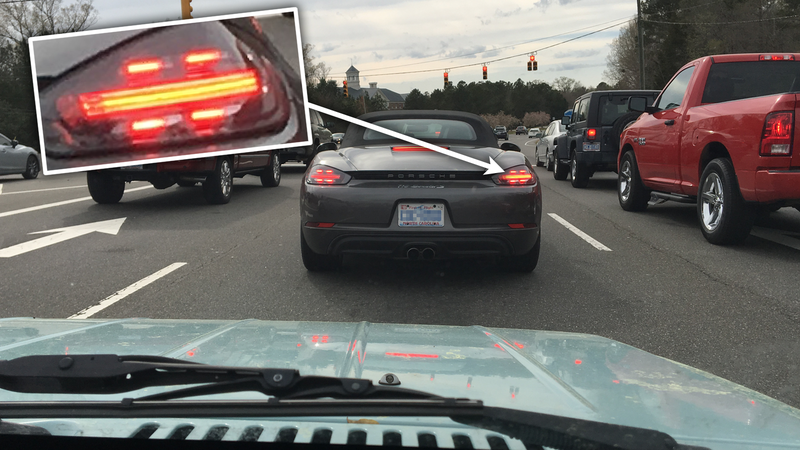 I was behind a current-gen Porsche Boxster in traffic today when I noticed something strangely familiar about its brake lights. I’m by no means convinced this was intentional, but that brake light pattern sure reminds me of something else automotive-related. Any idea what that is? Yes, those brake lights sure look like an old 8-bit racing car from a video game, specifically something like the very simple cars Atari used in games like Gran Trak 10. Could some Porsche lighting designer have thought to make something that resembles a little overhead race car from those LEDs in there? Maybe? Were they likely thinking about ‘70s-era video games? Ehhhh, sure? I mean, weirder things have happened, right? I don’t know. This is most likely just the unstoppable human urge to see patterns in things at work. Then again, that urge is why we can read five hyphens of light as a “car” at all in video games, so, really, who’s to say? I don’t care. I just like seeing little red 8-bit-style race cars pop up in traffic.